Remove Tapsnake popup virus from Mac OS X and prevent malicious scripts from running on random websites in Safari, Chrome and Firefox. The use of one piece of malware to distribute another is not uncommon in the computer threatscape. The Tapsnake issue exemplifies a tandem like that. 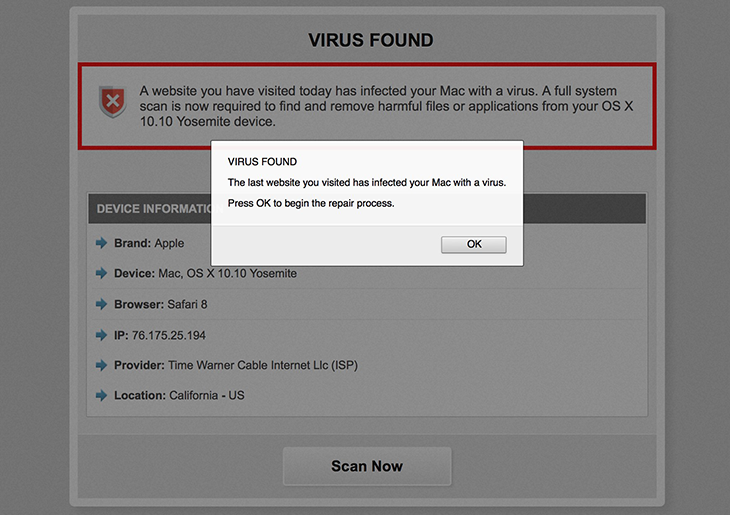 Problems begin with an adware sample infiltrating a Mac. It is a low-severity infection that doesn’t pursue any particularly destructive goals, but its role in distributing opportunistic software is crucial. This pest affects the web browsing environment on the system in the following way: it randomly displays popups that say “Download Required” when the victim is visiting regular sites. The alerts insist that the user “download the Mackeeper application to remove Tapsnake” from their Mac. Some of the virus information indicated there includes the risk level (high) as well as the infected file (/os/apps/snake.icv). It’s noteworthy that this malvertising campaign underwent a tweak over time to enhance the scare element of the hoax. The new variant of the deceptive alert reports 3 viruses, rather than Tapsnake alone, that allegedly pose risk to the Mac. The list of pseudo threats now includes Tapsnake, CronDNS, and Dubfishicv. In order to pressure the victim further, the following line has been added to the fake warning: “Your Mac is heavily damaged! (33.2%)”. In this scenario, the entry covering the purported location of the infected files looks more detailed, saying: “/os/apps/hidden/os-component/X/snake.icv; /os/local/conf/keyboard/retype.icv”. A slightly modified replica of the alert lists different locations, namely: “/mac/apps/hidden/finder/X/snake.dmg; /mac/local/conf/keyboard/retype.dmg; /mac/remote/conf/services/CronDNS.dmg”. The download recommended in this shady fashion is not a genuine security tool for Mac OS X or newer macOS versions. It’s MacKeeper, a phony Mac system utility that has gained notoriety for its unparalleled vitality and large-scale distribution via multiple concurrent campaigns going on for years. The bogus alerts about the detection of Tapsnake, CronDNS, and Dubfishicv label this controversial app’s rating as 9.9/10 – this should be with the minus sign to align with the actual state of things. All in all, it makes sense breaking this issue down into components. The troublemaker that shows on the early stage of the breach is an adware, whose mission is to hijack the default web browser in order to redirect the traffic and generate misleading popup warnings. Fortunately, this problem is isolated to the browser for the most part, which makes it clear where to start with the fix. Tapsnake may re-infect your Mac multiple times unless you delete all of its fragments, including hidden ones. Therefore, it is recommended to download Freshmac and scan your system for these stubborn files. This way, you may reduce the cleanup time from hours to minutes. Download NowLearn how Freshmac works. If the utility spots malicious code, you will need to buy a license to get rid of it. By clicking the “Remove Virus Now” or “Remove Viruses Now” button on those spoof notifications, the user runs the risk of installing another type of malware. In the better case scenario, a worthless pseudo-antimalware app will end up on the Mac and flood the system with yet more rogue warnings. In summary, these virus alerts do not actually report any real Mac threats – instead, those are ads triggered by a corrupt browser plugin when users go to normal web pages. Consequently, Tapsnake, CronDNS, and Dubfishicv are not the bugs to get rid of. What needs to be removed is the adware that attempts to cause the brainwashing effect. The steps listed below will walk you through the removal of this malicious application. Be sure to follow the instructions in the order specified. When confronted with malicious code like the Tapsnake alerts on Mac, you can neutralize its toxic impact by leveraging a specially crafted system utility. The Freshmac application (read review) is a perfect match for this purpose as it delivers essential security features along with must-have modules for Mac optimization. This tool cleans unneeded applications and persistent malware in one click. It also protects your privacy by eliminating tracking cookies, frees up disk space, and manages startup apps to decrease boot time. On top of that, it boasts 24/7 tech support. The following steps will walk you through automatic removal of the Tapsnake, CronDNS, Dubfishicv infection. Check whether the Tapsnake virus alerts has been fixed. If it perseveres, go to the Uninstaller option on Freshmac GUI. Locate an entry that appears suspicious, select it and click Fix Safely button to force-uninstall the unwanted application. Go to Temp and Startup Apps panes on the interface and have all redundant or suspicious items eliminated as well. The Tapsnake virus fraud shouldn’t be causing any further trouble.